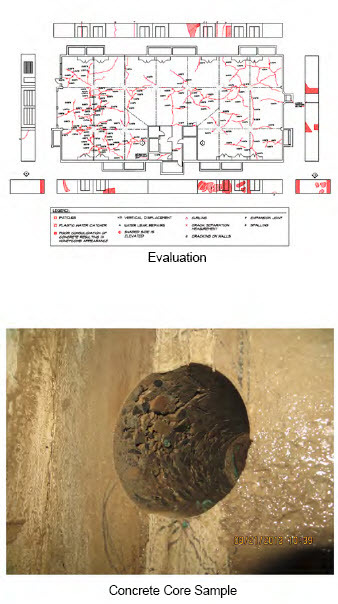 Falcon performed an overall evaluation on the concrete foundation walls and floors and gathered information on the existing garage site, including dimensions, crack locations and measurements, poor consolidation areas, expansion joint locations etc. Using the information gathered, Falcon created a concrete crack map to evaluate the severity of the concrete cracking and consolidation issue. Falcon had ten concrete core samples taken, of which six were petrographically analyzed for water to cement ratio, air void volume, and aggregate distribution. The analysis of the crack mapping allowed Falcon to prove the construction defects of improper placement of control joints and concrete curling due to improper curing. The concrete coring allowed Falcon to prove that the control joints were too shallow and the expansion joint was not installed properly.